Alex’s Million Mile – Run.Walk.Ride. CLICK HERE TO JOIN OUR 2015 TEAM!!! Bloggers along with their friends and families are fighting back against childhood cancer this September - National Childhood Cancer Awareness Month - with Alex's Lemonade Stand Foundation! We are asking you to JOIN US by making a donation, joining our team, or forming your own Alex's Million Mile - Run, Walk, Ride team! Give the gift of HOPE. Buy our team t-shirt, donate online or join our team! 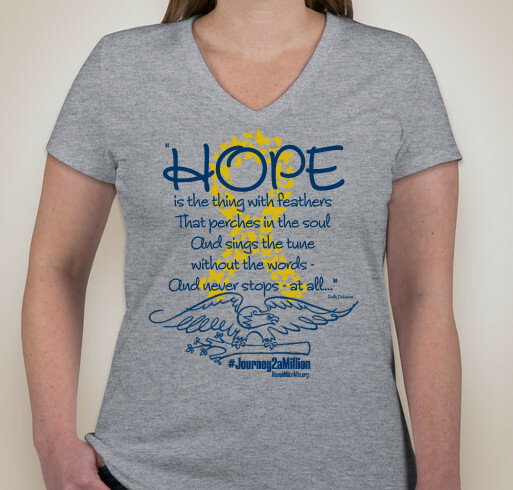 Go gold this September with our team t-shirt and give HOPE to all families who have faced childhood cancer. Delaware Valley area bloggers are fighting back against childhood cancer this September - National Childhood Cancer Awareness Month - with Alex's Lemonade Stand Foundation! We are asking you to JOIN US by making a donation, joining our team or forming your own The Million Mile - Run, Walk, Ride team! Our team was first inspired by two local childhood cancer heroes, Lily & Maggie. Lily was diagnosed with a brain tumor called ependymoma when she was 14 months old. Lily endured five brain surgeries and a month-long hospital stay at Children’s Hospital of Philadelphia. Brain surgery left Lily unable to sit, crawl or walk. But now, Lily who is 7, is cancer-free. Lily can walk and she can dance and jump and rock it on the soccer field! Lily can run! Lily will be running along with our team as we work to reach our goal of 1,000 miles and $1,000 for a cure for all kids with cancer! Maggie was diagnosed with acute lymphoblastomic leukemia (B-ALL) just a few months ago in May at 2 years old. All of her life, Maggie has been a whirlwind of giggles and red curls. And even though cancer and aggressive chemotherapy has temporarily stolen those lovely curls, they did not steal her tenacious spirit. Maggie and her parents fought this disease with everything they had. Finally, on July 5, Maggie was declared cancer-free! However, she will continue to receive a variety of treatments and testing to ensure that she stays healthy. As she works on regaining her physical strength, we will walk and run for Maggie!